Cut The Fat, Cut The South? The Washington Post’s Wonkblog is calling out the South. Sobering statistics. So, let’s break it down. The states with the highest rates of adult obesity, according to the Post’s study, are Mississippi and West Virginia with 35.1%. The states below that 35% high-water mark in the South are Arkansas 34.6%. Tennessee 33.7%. Kentucky 33.2%. Louisiana 33.1%. Alabama 32.4%. South Carolina 31.7%. Georgia & North Carolina come in just around 30% with 30.3 and 29.4, respectively. The Commonwealth’s obesity rates are better than many of our peer states, 27.2%, with Florida ranking just better at 26.4. Nationally, that puts Virginia behind the middle of the pack. Washington state also weighs in with 27.2% of their adult population obese. 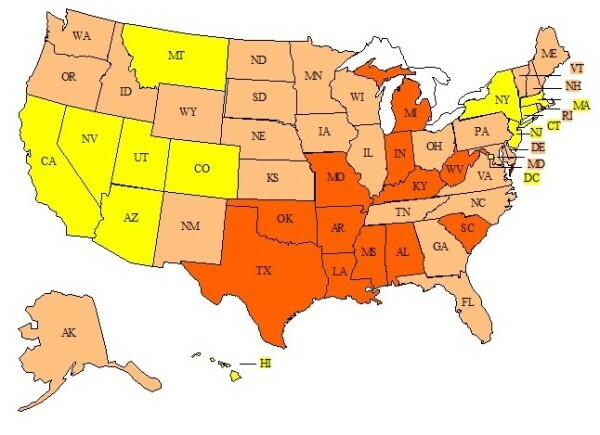 Unlike the bottom of the list which is truly concentrated in the South and Southeast, specificially, the leaders in this study with the lowest adult obesity rates were really scattered across the country. The study digs deeper into demographic disparities that cross state boundaries. Recently, the US Surgeon General called physical inactivity THE biggest public health issue in the country. The Washington Post’s latest look at our obesity statistics seem to concur. Physical activity is one of the most important ways for individuals, communities, and whole states to begin to shake up these statistics.